Febin Melepura MD, a top rated, best in class NYC pain management doctor, nationally recognized pain relief specialist and is a leading pain doctor. Dr. Melepura is among the best pain management doctors in New York. He is an award winning expert and contributor to a prominent media outlets. Top rated pain management specialist in NYC Dr. Melepura has been recognized for his thoughtful, thorough, modern approach to pain care and, among other accolades, has been named a “top pain management doctor in New York”, and one of “America’s Top Doctors™” for sports pain management in New York. Best in class, top rated New York pain management doctor, Dr. Melepura provides highly personalized and comprehensive pain care in NYC. He is among the best pain relief doctors in the country. Pain specialist Dr Melepura board certified by American Board of Anesthesiology and Pain Medicine (Anesthesiology). He offers the most advanced pain management treatments available in the USA. Come see our new cutting edge, state-of-the-art pain management clinic in NYC. 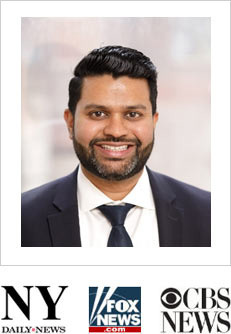 Dr. Febin Melepura is an Ivy League trained (Columbia University Medical Center, Stony Brook School of Medicine) sport injury doctor and best rated pain management specialist in NYC who is highly specialized in treating any pain related issues – from neck and back pain to sports related injuries. Back pain relief is one of the most common reasons people seek a pain doctor's care. Neck pain relief usually comes after a brief period of rest and light neck pain treatment. Shoulder pain can severely limit your activity levels without proper shoulder pain treatment. Knee pain can lead to serious complications if you don't receive knee pain treatment. Pain in elbow complaints are common, especially among athletes and those with physical jobs. Hip flexor pain can strike at any time, but it's most common among athletes who bend and kick. Wrist pain can occur due to everything from trauma to long-term wear and tear. Inner ankle pain usually results from years of pressure placed on your ankles when you run. Visit our pain doctor in NYC, a pain treatment specialist Dr. Melepura for best in class treatment options. Same day emergency appointments are available at the Midtown Manhattan doctor’s office. As the New York back pain management and sports injury pain treatment specialist, Febin Melepura MD takes a new, whole body philosophy when treating our patients. At our Pain Management Clinic we utilize the entire range of safe and effective pain treatment techniques and modalities to treat back, neck, knee, pelvic pain and discomfort. Located in Midtown NYC, in the heart of New York City, the Sports & Pain Management of New York center boast certified and approved pain treatment clinic. Our comprehensive & unique approach to pain care is individualized. We always consider a non-invasive pain management treatment options first. Expect to find relief, comfort, cutting-edge technology and continued support from your NYC team of pain management specialists. With the right diagnosis and the best treatment plan, you will be back to your daily routine with minimal downtime. Come see the top rated pain doctors in New York to receive the highest level of pain care. At Pain Management Clinic in NYC, the best rated pain care specialist Dr. Melepura provids a full range of different medical treatments in New York City for patients suffering from acute and chronic pain. A team of New York pain management doctors and physical therapy specialists work together to provide you with the necessary pain relief. Dr. Melepura has been recognized for his thoughtful, thorough, modern approach to pain management and pain relieve care and, among other accolades, has been named a “top pain management doctor in New York”, and one of “America’s Top Doctors™”. When you want to know how to get rid of lower back pain, you have to see a New York City specialist. Your sports and pain doctor knows how to relieve lower back pain. Lower back pain treatment varies depending on whether you have sacroiliitis (or sacroilitis), lower left back pain or lower right back pain. Neck pain relief usually comes after a brief period of rest and light neck pain treatment. How to get rid of neck pain is determined by the cause of your discomfort and your response to recommendations at your neck pain treatment center. How to relieve neck pain when you have chronic neck pain may require more advanced techniques, most of which are non-invasive. A swollen knee can signal either that your knee is just be overused and in need of rest or that you are exhibiting a symptom of a more serious knee injury. Your Manhattan sports medicine doctor treats common knee injuries and provides swollen knee treatment and knee injury treatment to get you back to your normal activity level as soon as possible. Visit a Sports Injury & Pain Management Clinic of New York that respects your time, your feelings and your goals, both medical and personal. You’ll find an experienced pain management specialists who cares about your general well-being, your appearance and your overall health at Sports & Pain Management of New York of NYC. Dr. Melepura took his time with me unlike other pain management doctors to discuss my issues. He was very thorough and presented me with multiple pain management options. Very refreshing. "Nicholas Adams"
Dr. Melepura has been fantastic in helping me with multiple injuries. He is easy to talk to, has great bedside manner, and is incredibly articulate in how he explains the body and my diagnosis. What I also really like about him is that he offers multiple forms of pain relief treatments and ways to go about treating what is ailing me. "David Bauer"
To have a sports injury doctor who upon meeting you and scheduling an appointment says “Feel free to call me on my cell if you have any issues or questions” is refreshing. There’s something very modern and in his approach and healthcare. He authentically caters to our on-the-go lifestyles while delivering the high touch experiences we want. Excellent doctor! "Herman Best"
Dr. Melepura saw me for neck pain, and was very helpful in his diagnosis and treatment. He was attentive and descriptive when explaining things, the pain management office was very modern and clean, and the staff was friendly. Highly recommended. "Aidan Schultz-Meyer"
© 2019 Sports Injury & Pain Management Clinic of New York, Best rated pain management clinic in NYC.